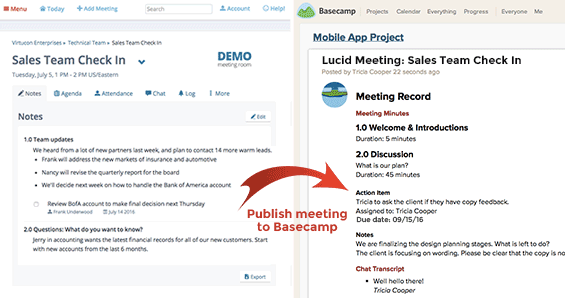 Lucid Meetings integrates seamlessly with Basecamp to make your projects run like clockwork. Easily add all project team members to your meetings, and see your meeting records, to-dos, and agendas instantly in show up in your Basecamp project. Review full records of your meetings right in Basecamp. You can see who attended what meetings, what notes were taken, and what to-dos were assigned.